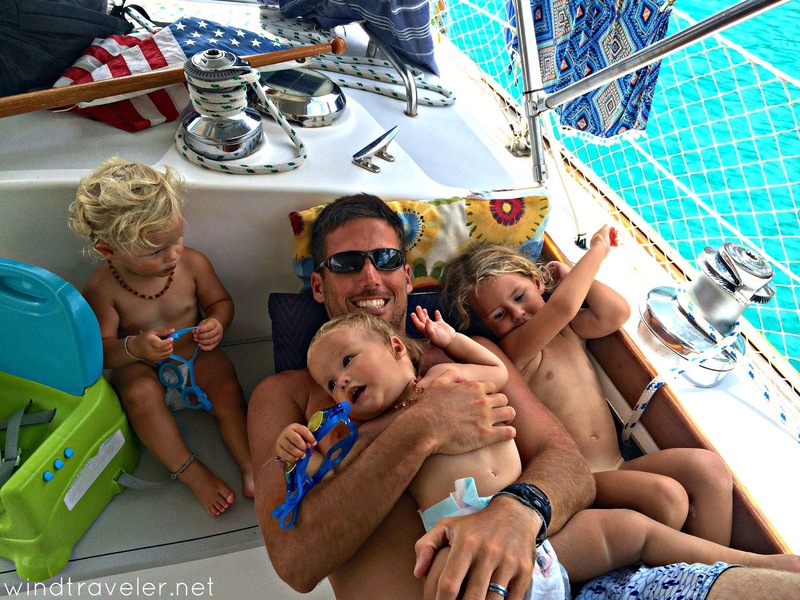 Boating and babies go together better than you might imagine, however, there are a few concessions one must make in order for the transition to be a smooth one. The boat you choose is a big one. The vessel you select for your journey – it’s pedigree, age, performance and features – can and will hugely impact your experience and enjoyment. This rule applies whether or not you have kids on board. There are certain traits, however, that really seem to suit the “baby on board” moniker. After three kids and over four years of boating with babies and/or toddlers we have compiled a list of ten boat characteristics that make life afloat with little ones easier. If you are like me, anything that makes the already hard job of parenting less of a crazy train is worth noting, so take heed. These things might not be “essential” but will almost certainly impact the frustrating vs. fun factor. Never in a million years would I have outfitted a boat with white vinyl cushions, but holy heck am I glad webought a boat with them. I cannot even IMAGINE what our cushions would look like if they were regular interior fabric because the amount of food, sauce, paint, marker, crayon, pen, playdoh, juice and you don’t even want to know what else I have wiped off is INSANE. Three toddlers are messy. Period. Our cushions not only clean up like a breeze, but make me more laid back about messes (and making them! which, mind you, goes against my very tidy nature but is great for kids) because, “It’s cool, kids! Don’t sweat that spilled paint! Look, we just wipe it right up!” I mean, I wash our cushions using the same spray cleaner I use for the counters. It. is. awesome. Would not want a baby boat without them. THIS ARTICLE WAS ORIGINALLY WRITTEN FOR ZIZOO BOATS. I admire and am intrigued by your lifestyle. What a fun adventure for your little ones! Happy travels! Hello Windtraveler! We've been reading your blog for years now and can't thank you enough for all of the inspiration and knowledge you continuously share. The timing of this post is uncanny. My husband actually flew to San Francisco yesterday to survey the boat we are about to close on. Major step for us given this part has been 4 years in planning and I am now pregnant with our first! The one question I have about this post is—what if the boat doesn't have a swim platform? The boat we may buy actually has quite the raised stern with a long swim ladder (link to boat below). Any recommendations on how to make getting on/off this particular boat with children a little easier? What have you seen out in the cruising community as curious solutions? Children love cars, trucks, planes, boats and anything else big that moves. And that's the premise behind the Baby Einstein On The Go DVD. It's an ideal way to introduce your little one to the wonderful world of travel. What gorgeous photos, and a lovely boat! I can see how it can be so comfortable and fun for the family. Thanks for sharing! We were planning to leave for a vacation but sailing seem to be out of our reach because we were scared as we also have kids. Taking kids on board seems to be difficult but after seeing you guys enjoying so much, we have decided to go sailing only. Thanks for sharing your fun moments with us.